This is a book by a poet about being a poet. 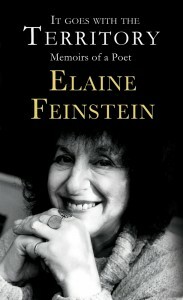 Elaine Feinstein believes that for most women, writing is an interruption to daily life, but in her case, life interrupted writing. ‘My desire to make poems and stories was as intense as any adultery,’ she says. Now in her eighties, Feinstein can look back on a remarkable career during which she produced novels, plays, biographies, translations and above all poetry collections. At the same time she had three sons, an unusually demanding and needy husband and, for much of her life, a full-time job. Feinstein was born in Liverpool and grew up in Leicester. Her family, all of Russian origin, were practising Jews. She was an only child and a clever one. For a grammar school girl to get in to Cambridge in 1949, when there were only two women’s colleges, was quite a feat. At Newnham College she saw herself as a ‘gatecrasher in the gardens of privilege’, but by the time she graduated she was more self-confident. She married a molecular biologist called Arnold Feinstein and they had three sons. They lived for many years in Cambridge where they met and became friends with a wide variety of poets and scientists, many of them with names that were already or later became famous. As a matter of fact, although I don’t think that Feinstein intended it, her husband comes over as a selfish and dreadfully difficult man, often suffering from extreme depression and evidently incapable even at the best of times of making up his mind. She seems to have spent a lot of her life ‘furthering his happiness’. And he seems to have spent a lot of his making her unhappy. However, she overcame the difficulties and, once established as a poet and novelist, became a ‘member of the literary bohemia I had always wanted to join’. Invited to poetry readings, literary festivals and other such jollies, and to lecture for the British Council, Elaine leapt at the chance of travelling all over the world, particularly to Russia. She translated the poems of Marina Tsvetaeva and wrote biographies of Pushkin and Anna Akhmatova. Both on such journeys and at home, she met people with names worth dropping. Flipping through the pages at random, one comes across numerous poets and writers: Ted Hughes, Elizabeth Smart, Faye Weldon, Alan Sillitoe and many others, including the editor of bookoxygen, Elsbeth Lindner. From Bohemian to fully paid up insider, Feinstein is now on the Council of the Royal Society of Literature, a judge for important literary prizes, and acquainted with the greats in her own field. She has described the making of a member of the literary establishment and her book outlines a successful and worldly life. But what matters to Feinstein herself is the poem that arrives like magic. ‘My poems come to me in sentences, spoken or thought, which seem to carry their own tune in them along with their syntax.’ Those she quotes in this book will whet the reader’s appetite for more.